Congratulations to our Client Mixed Chicks for their feature in Woman’s Day Magazine! The world is becoming more and more diverse, and Mixed Chicks hair products celebrate that with a product line especially made for multi-cultural women. You’ll love the way these non-sticky, lightweight curly hair products leave your hair inviting to touch as they define and lock moisture into every curl. Mixed Chicks products not only work on wavy, tightly curled or straight hair but also on weaves. Wendi LevyÂ andÂ Kim EtheredgeÂ , two â€œmixed chicks,â€ created the product line because they needed it. Then, something happenedâ€¦friends and family started encouraging them to package it, and soon they had a full blown business running out of the garage. After a little door to door hustling, a fewÂ celebrity endorsements,Â and a ton of online customer support, Mixed Chicks is bringing its products to the world. 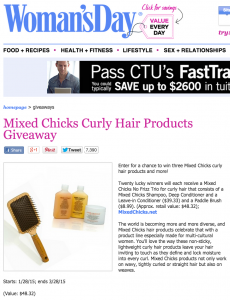 Check them out at mixedchicks.net and be sure to head on over to Woman’s Day for your chance to winÂ a Mixed Chicks No Frizz Trio for curly hair!